Ontario’s Green Religion 2: indoctrination? | Mothers Against Wind Turbines Inc. 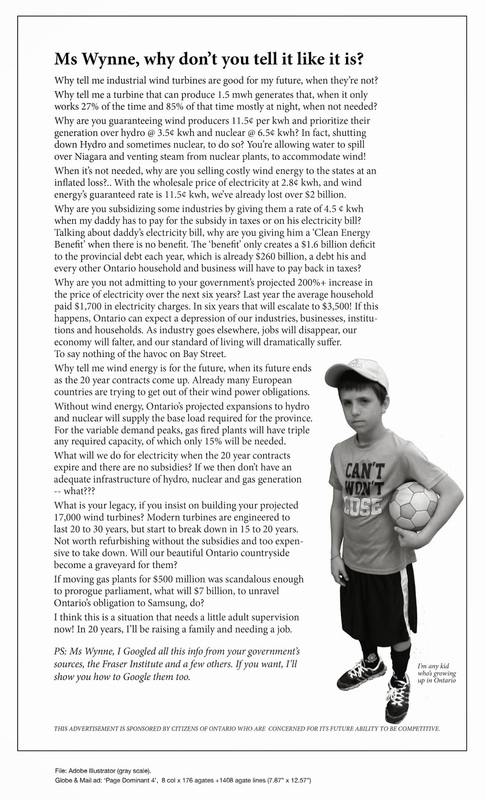 Yesterday, we covered how the Ontario Power Authority website kids.saveonenergy.ca is clearly aimed at teaching our children and grandchildren about the wonders of renewable energy without scientific evaluation or offsetting arguments. This 58-page agenda, created with funding support from the Ontario Teachers Federation, sure doesn’t look like “science” as most remember it. Webster’s defines science as “the state of knowing,” not a “doctrine” which is defined as “a statement of fundamental government policy”! A review of the suggested curriculum clearly indicates the students are being taught the latter; its content is aimed at pushing the Grade 5 students to accept wind, solar and water power generation as the Holy Grail. Concurrently, the students are led to believe the production of power from uranium or fossil fuels is toxic.